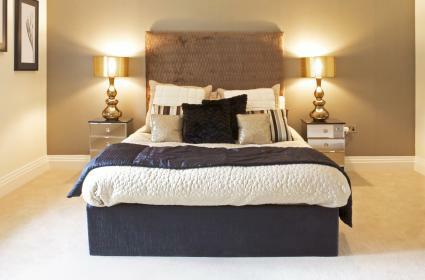 You can create a designer look for your bedroom by layering the bedding. Follow a few design guidelines and you'll end up with a great-looking sleeping space that provides a perfect retreat for relaxing and getting the restful sleep that you need. There is a method to layering bedding that works for any design options you choose. It may sound odd, but the first layer of bedding you'll select is the top layer. You should select it first because it is the most visible layer. This can either be a bedspread, comforter, duvet or quilt. The top layer of bedding will set the color scheme, décor theme and overall design style for your bed. Select this visible piece of bedding based on your bedroom colors and design. If you opt for a solid-colored top layer, consider different colors or a pattern or two for the other layers. The next layer to select is the pillows. This includes pillow shams and decorative throw pillows. Most quilts, bedspreads, comforters, etc. come with a matching set of pillow shams. Use these in the second row of pillows, with the first row being those covered with pillowcases. 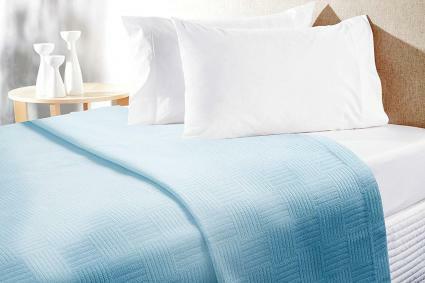 For a king-size bed, there are usually three pillow shams that match the quilt, comforter, etc. If you only have two shams that match your top layer, you can add a third by selecting one of the colors in the comforter (or other top cover) pattern. Add decorative pillows to suit the overall room décor and your personal preference. If you like to sleep with a quilt or blanket between the top sheet and your bedspread, comforter, duvet, or other top layer, select one that coordinates with your overall colors and patterns. Pay attention to the texture and be sure to choose one that will enhance your ensemble. The most obvious first layer is the top and bottom sheets with matching pillowcases. Depending on how you make the bed, these may not be seen until you climb into bed. However, they should still coordinate with the other layers. 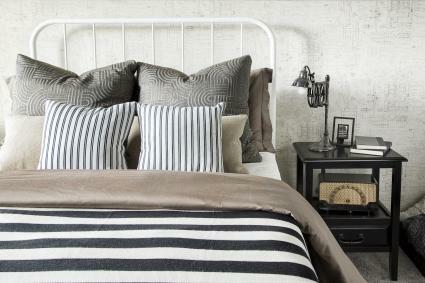 A solid-color, pinstriped or small patterned sheet set that coordinates with your top layer is a good choice. If you are using a solid-colored sheet set with a patterned top layer, choose a color from your bedspread, comforter, etc. You can add even more style with a few final layering touches. Consider placing an additional blanket or quilt at the foot of the bed. One design option for a blanket or quilt is to fold it over itself at the foot of the bed or fold it in accordion style. This allows it to easily be pulled over the bedspread or comforter for added warmth. A throw featuring any type of texture, color or pattern is also a lovely final touch to add to your bedding ensemble. Drape it at an angle over the bed, starting at the middle and extending to the foot of the bed. The goal is to make the draping look casual and unplanned. Depending on your bed and bedding, you may also want to use a bed skirt or dust ruffle to complete the designer look. This can be a ruffled style or box pleat design. Of course, if you are using a bed skirt, it should be in place before you begin making the bed. The steps for assembling your layers are basic and easy to follow. Make the bed by putting the fitted and top sheets on the bed along with the matching pillowcases on pillows. (Optional) If you want to insert a quilt or blanket between the top sheet and top layer, do so now. Fold the top sheet over the quilt, revealing the bottom sheet and hem of the top sheet. Cover the sheets (or the optional quilt or blanket) with the top layer (comforter, duvet, bedspread or quilt). Add pillows, starting with the bed pillows covered in pillowcases that match the sheets. These typically go in the very back against the headboard, but you can use as the second layer of pillows if the color, texture and pattern demand the contrast. Layer the pillow shams, using either Euro or regular shams. Using both gives the opportunity to add more texture, colors and pillow sizes. Add decorative pillows. These can be repetitive patterns of the top layer and other layers. Place the larger pillows in the back rows with smaller ones in the front. Alternate the rows with solids, patterns and textures. Gradually diminish the number of pillows so you end up with two or three smaller pillows ending with a bolster in the very front. If using a blanket, quilt or throw for an extra finishing touch, add it to the made bed. 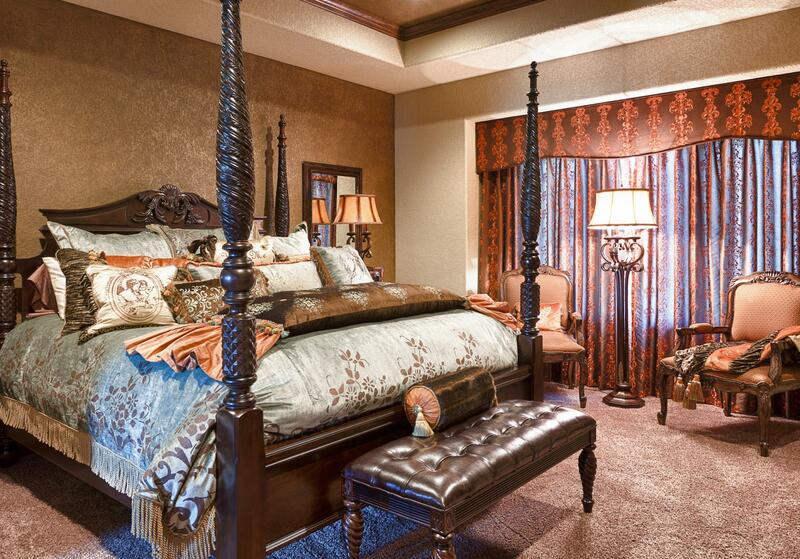 It's easy to create a designer look by layering the bedding. 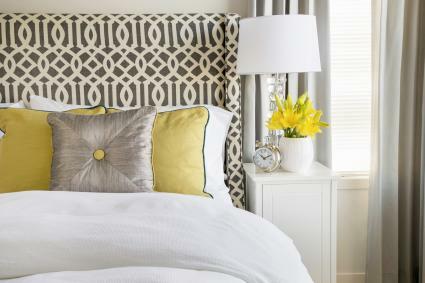 This technique gives a great finish to any bedroom by using textures, colors and patterns.